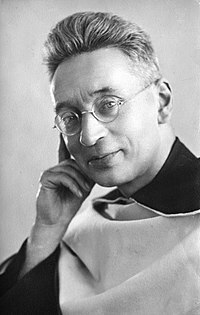 Titus Brandsma (23 February 1881 – 26 July 1942), was a Dutch Carmelite friar, Catholic priest and professor of philosophy. Brandsma was vehemently opposed to Nazi ideology and spoke out against it many times before the Second World War. He was imprisoned in the infamous Dachau concentration camp, where he died. He has been beatified by the Roman Catholic Church as a martyr of the faith. Brandsma was born Anno Sjoerd Brandsma to Titus Brandsma (died 1920) and his wife Tjitsje Postma (died 1933) at Oegeklooster, near Hartwerd, in the Province of Friesland, in 1881. His parents, who ran a small dairy farm, were devout and committed Catholics, a minority in a predominantly-Calvinist region. With the exception of one daughter, all of their children entered religious orders. As a young boy, Brandsma did his secondary studies in the town of Megen, at a Franciscan-run minor seminary for boys considering a priestly or religious vocation. Brandsma entered the novitiate of the Carmelite friars in Boxmeer on 17 September 1898, where he took the religious name Titus (in honor of his father) by which he is now known. He professed his first vows in October 1899. Ordained a priest in 1905, Brandsma was knowledgeable in Carmelite mysticism and was awarded a doctorate of philosophy at Rome in 1909. He then taught in various schools in the Netherlands. From 1916 on, he initiated and led a project to translate the works of St. Teresa of Ávila into Dutch. In 1921 Brandsma worked to resolve a controversy concerning Belgian artist Albert Servaes' depiction of the Stations of the Cross. From this came his series of meditations on each of the 14 stations. One of the founders of the Catholic University of Nijmegen (now Radboud University), Brandsma became a professor of philosophy and the history of mysticism at the school in 1923. He later served as Rector Magnificus. He was noted for his constant availability to everyone, rather than for his scholarly work as a professor. Brandsma also worked as a journalist and was the ecclesiastical adviser to Catholic journalists by 1935. That same year he did a lecture tour of the United States, speaking at various institutions of his Order. After the invasion of the Netherlands by the Third Reich in May 1940, it was Brandsma's fight against the spread of Nazi ideology and for educational and press freedom that brought him to the attention of the Nazis. In January 1942 he undertook to deliver by hand a letter from the Conference of Dutch Bishops to the editors of Catholic newspapers in which the bishops ordered them not to print official Nazi documents, as was required under a new law by the German occupiers. He had visited 14 editors before being arrested on the 19th of that month at the Boxmeer monastery. After being held prisoner in Scheveningen, Amersfoort, and Cleves, Brandsma was transferred to the Dachau concentration camp, arriving there on 19 June. His health quickly gave way, and he was transferred to the camp hospital. He died on 26 July 1942, from a lethal injection administered by a nurse of the Allgemeine SS, as part of their program of medical experimentation on the prisoners. Brandsma is honored as a martyr within the Roman Catholic Church. He was beatified in November 1985 by Pope John Paul II. His feast day is observed within the Carmelite Order on 27 July. In 2005 Brandsma was chosen by the inhabitants of Nijmegen as the greatest citizen to have lived there. A memorial church now stands in the city dedicated to him. Brandsma's studies on mysticism was the basis for the establishment in 1968 of the Titus Brandsma Institute in Nijmegen, dedicated to the study of spirituality. It is a collaboration between the Dutch Carmelite friars and Radboud University Nijmegen. In his biography of Brandsma, The Man behind the Myth, Dutch journalist Ton Crijnen claims that Brandsma combined some vanity, a short tempered character, extreme energy, political simpleness, true charity, unpretentious piety, thorough decisiveness and great personal courage. His ideas were very much those of his own age and modern as well. He offset contemporary Catholicism's negative theological opinion about Judaism with a strong disaffection for any kind of Antisemitism in Hitler's Germany. Brandsma was honoured by the city of Dachau with a street adjoining the former camp, albeit one of the narrowest streets in the town. ^ Rees, Joseph (1971). Titus Brandsma: A Modern Martyr. London: Sidgwick and Jackson. pp. 15–16. ^ a b c d e f "Bl. Titus Brandsma". Carmelites Friars. Retrieved 28 February 2013. ^ Glueckert, Leopold G. (2002). Friar Against Fascism. Carmelite Press. p. 1. ^ Rees, Joseph.Titus Brandsma: A Modern Martyr. 49–50. ^ Butler, Alban. Butler's Lives of the Saints. Edited by Bernard Bangley. Paraclete Press: 2005. Record for 26th July (Feast Day). ^ "Home". Titus Brandsma Memorial (in Dutch). Retrieved 28 February 2013. ^ "The Institute". Titus Brandsma Institute. Retrieved 28 February 2013. ^ Crijnen, Ton (2008). Titus Brandsma, De man achter de mythe – de nieuwe biografie (in Dutch). Nijmegen: Valkhof Pers. ISBN 978-90-5625-278-6. 'Blessed Titus Bransdma' (Leaflet) : The Friars, Aylesford, Kent, UK. Brandsma, Titus. Carmelite Mysticism Historical Sketches. Darien, IL: Carmelite Press, 2002. Brandsma, Titus, and Albert Servaes. Ecce Homo: Schouwen van de weg van liefde/Contemplating the Way of Love. Edited by Jos Huls. Leuven: Peeters, 2003. Clarke, Hugh. Titus Brandsma (Pamphlet). London: Catholic Truth Society, 1985. Dölle, Constant. Encountering God in the Abyss: Titus Brandsma's Spiritual Journey. Translated by John Vriend. Dudley, MA: Peeters, 2002. Wikimedia Commons has media related to Titus Brandsma. "Global Significance of Titus Brandsma for Journalism"